I am not a perfectionist. I never have been. Yes, it’s true that I can be a control freak, but that’s because I want things done in a certain way, not necessarily to be perfect. If you’ve ever worked with me in the kitchen, you know what I mean (and you have sworn never to set foot in a kitchen where I am cooking again). I’ve always believed that the amount of resources necessary to achieve that last sliver of perfection are proportionately much larger than the potential benefits gained. So, in my work and my cooking, I’ve always believed that really good is as good as perfect. A few rough edges here and there add character. Especially when it comes to food. I’d rather spend my energy trying new recipes or heck, enjoying the food I made, than chasing the perfect crust or the quintessential balance of flavors. But once in a while, perfection will just land in your lap, like a gift from the heavens. That’s the case with this recipe for the perfect roast chicken. It comes from the people who actually do look for perfection, experimenting with recipes again and again until they get them, well, perfect. I’m talking about the team behind Cooks Illustrated and America’s Test Kitchen. I’ll admit, sometimes I think they fall short of their goals. But in this case, they reached the summit of chicken-y perfection. This isn’t a tough recipe, but it does require some planning. The chicken really needs to sit in the fridge for at least 12 hours, even better if it’s a full 24 hours. So, the night before you will be roasting it, you’ll need to prep it. It’s not tough. It’s a little icky at first (it involves separating the skin from the meat with your fingers) but after the first time, you’ll get used to it. But here is the best part. The chicken comes out perfect. Every. Single. Time. The skin is unbelievably crisp and crackly, without even a hint of fat underneath it. The meat is incredibly juicy. 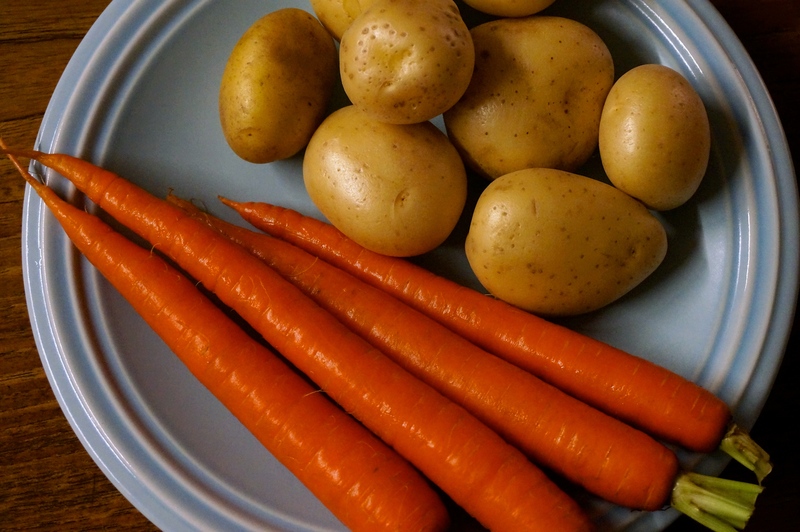 And the potatoes and carrots that have been roasting in chicken fat almost outshine the chicken itself. I’m not a perfectionist. But thank god other people are. 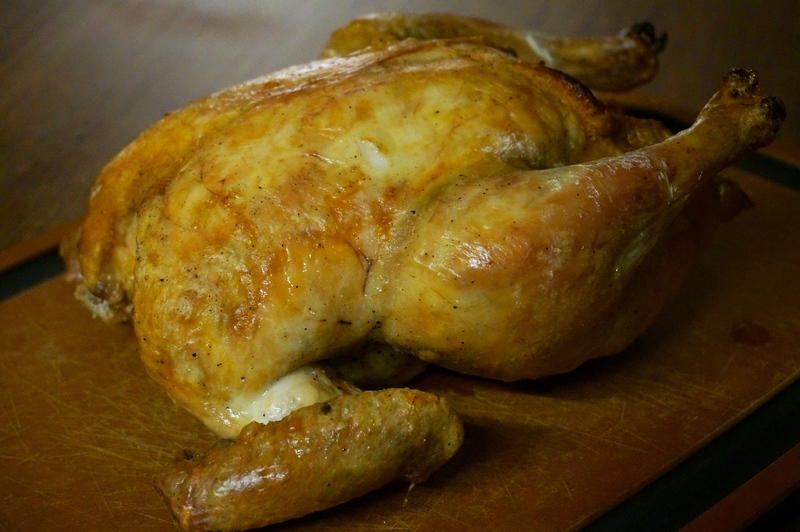 Without them, we wouldn’t have this recipe for the perfect roast chicken. Pat dry the chicken, inside and out. 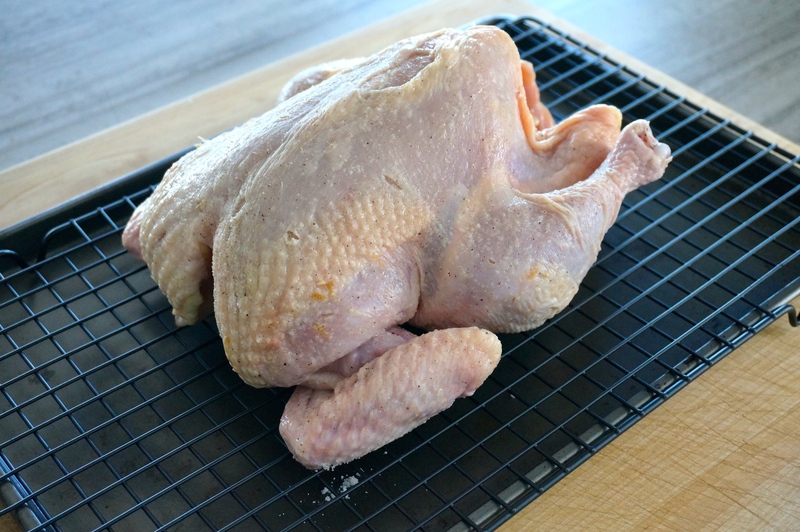 Using a sharp paring knife, cut four slits along the back of the bird. Using your fingers, carefully loosen the skin from the breasts, thighs, and legs. Start by inserting your fingertips under the skin from the large cavity side. Keep moving your fingers side to side moving down the breast towards the neck. Move all the way to the leg and thighs and loosen as much of the skin as you can, being careful not to tear it. 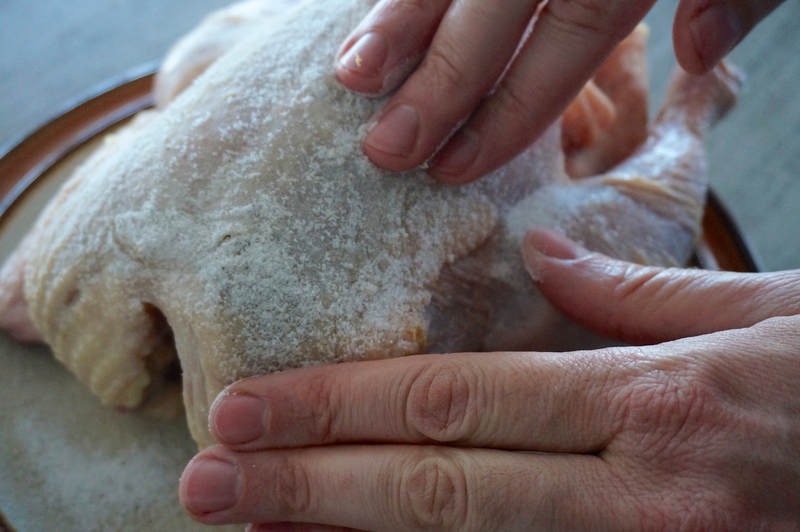 Using the tip of the sharp paring knife, poke the skin of the chicken about 20 times. Do that all around, including the back, the legs and the thighs. Tuck the wing tips under the bird. 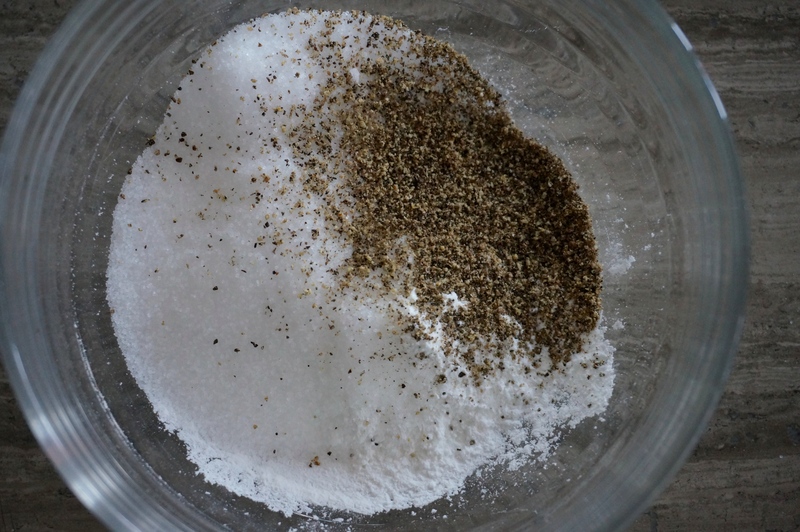 In a small bowl, whisk together the salt, baking powder, and black pepper. Rub the mixture all over the chicken (over the skin; don’t rub the mixture under the skin). Make sure you rub it on the entire skin, including, the back, wings, legs, and thighs. Place on a rack over a roasting pan and set in the fridge, uncovered for at least 12 hours, preferably 24 hours. The next day, peel potatoes and carrots and slice in 1/4 inch slices. Mix with oil, salt and thyme. Preheat the oven to 450º F. Put heavy duty foil in bottom of roasting pan. Spread potatoes and carrots evenly. Make sure you have enough potato and carrot slices to cover the bottom of the roasting pan. When the oven is hot, flip the chicken breast-side down and roast on a rack on top of the roasting pan with the potatoes and carrots for 25 minutes. Flip the chicken breast-side up. Roast for an additional 20 minutes. 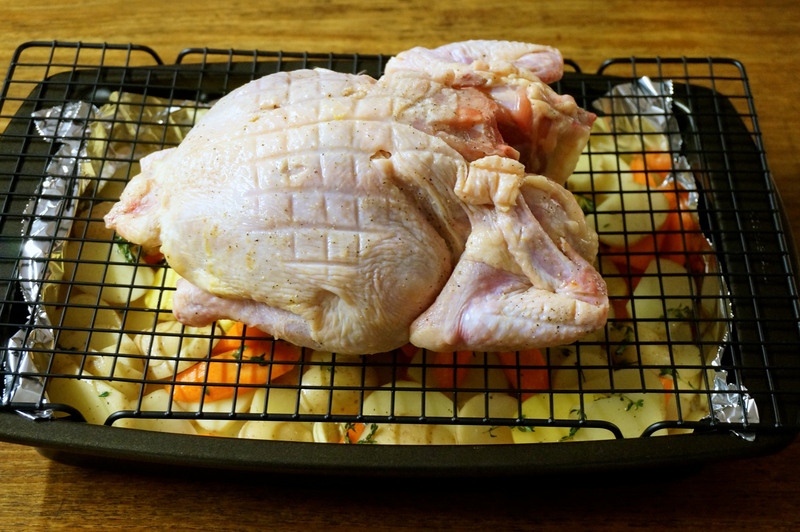 Raise the heat to 500º F. Continue roasting another 10-15 minutes, until a thermometer inserted in the thickest part of the thigh registers 160º F.
Remove from the oven and let chicken rest for 5-10 minutes before carving. Serve alongside roasted potatoes and carrots. 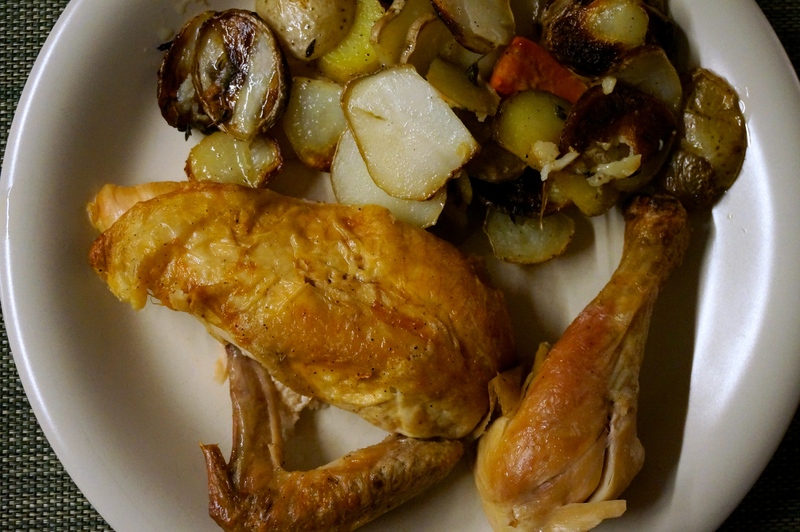 This entry was posted in Recipes and tagged america's test kitchen, carrots, cooks illustrated, Perfect Roast Chicken, potatoes, roast chicken. Bookmark the permalink.